With our personalized fraternity flip-flops, slippers, sandals, sliders and clogs, you can step out in style and celebrate being a Greek. 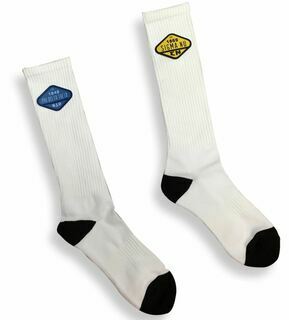 Our footwear is comfortable and stylish, featuring sharply printed fraternity names, letters and in some cases, crests. Our Toegoz flip-flops have colorful straps with your letters printed in large text. You can select from many combinations of strap and letter colors. Our crazy and vibrant fraternity crest flip-flops have Greek letters, crest and an optional line of personalization on durable rubber. These flip-flops definitely "bring the party." Our Greek patch sandals are sleekly styled and come in 4 different strap colors. 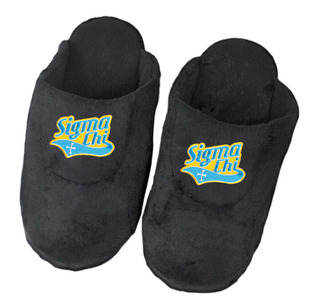 We offer 4 styles of sorority and fraternity slippers that are perfect for relaxing around the house or dorm room. These cozy slippers would be an excellent holiday gift for a big brother or big sister. You can choose from Greek lettering, the fraternity or sorority name and crest, in either two-tone group colors or solids. 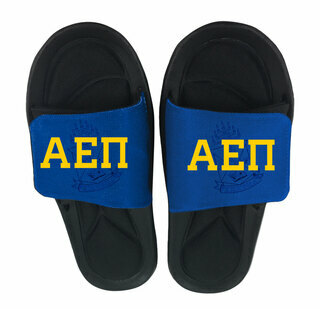 We also have heavy duty fraternity sandals with your frat name and letters emblazoned on the wide strap. Our very popular Circle Sliders have your Greek letters printed inside a solid circle. 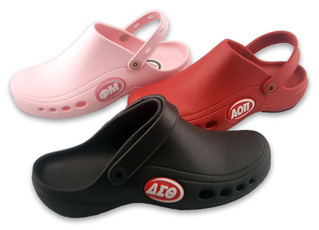 The Greek rubber clogs feature circled letters from your fraternity or sorority on the side, and are available in several different colors. Send a friend, frat brother or yourself off on a memorable Spring Break with our Spring Break gift set. We include our extra-large 32-ounce fraternity cup and matching slickly designed Toegoz sandals - all you'll need to lounge around on campus, at the beach or wherever Spring Break madness takes you. Speaking of madness, feast your eyes on the wild styling and eye-popping colors of our fraternity flip-flops that we have available for many different Greek groups. These festive flip-flops practically scream "beach day" but are also handy to have on campus, indoors or out, as something to quickly slip into for casual wear. Flip Flops & SlippersThe Greatest Selection. Period.